“Today, December 12 is the coordinated one day West Coast Port blockade to shut down the commerce of the 1%. Occupy San Diego, LA, Oakland, Portland, Tacoma, Seattle, Anchorage, and Houston are participating in solidarity with Longshoremen in Longview, Washington already on strike against grain subsidiary EGT. A Longview Union rep came down to attend an Occupy Oakland General Assembly on November 18 to ask for a coordinated shutdown. Landlocked Denver wants to occupy the Wal-Mart distribution Center, while other occupies talk of engaging Goldman Sachs. 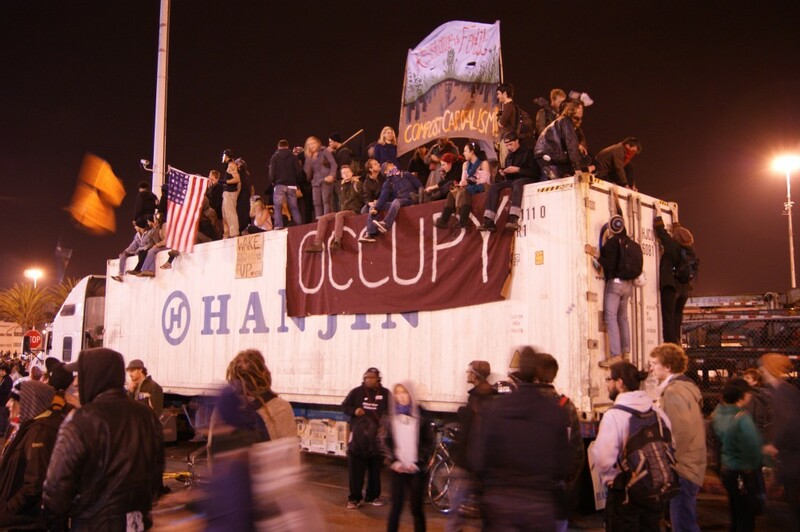 Goldman Sachs has 51% ownership of SSA terminals on the Pacific Coast, and has impeded trucker unionizing efforts while at the same time designating truckers as independent contractors that get paid by the load and receive no benefits. Occupy Maui, Honolulu and Hilo announced they are on board with their own direct action in response to imports which dominate over policy and practices for self-sustainable agriculture and goods production on the islands. Tokyo General Union announced its support of the West Coast port shutdowns yesterday.